Jaguar Land Rover has launched the most expensive Sports Utility Vehicle in the Indian market. 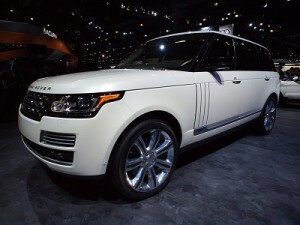 The new breed has been launched into the market as ‘Range Rover Autobiography LWB (Long Wheelbase)’. The manufacturer has priced petrol version of the SUV for just Rs. 3.83 crores and the diesel version SUV is priced for just Rs. 3.75 crores only. The LWB edition of the Range Rover SUV comes with much spacious cabin and the wheelbase of the model is slightly greater when compared with the previous edition. The rear passengers get additional leg room of more than 140 mm in the new edition Range Rover. The new edition comes with a wide number of cosmetic upgrades along with few improvements to the engine and performance. Indian buyers can choose from either of 21 inch 7 spoke alloy wheels or 22 inch 7 spoke alloy wheels for the Range Rover Autobiography LWB edition. Rear row of seats also comes with inbuilt massaging system which is very useful for getting relief during journeys. The rear row of seats get electrically operated table with inbuilt cup holders along with integrated USB ports. These seats also comes with a 17 degree recline ability and also comes with electrically operable armrests. Some of the most significant features of the brand new Range Rover Autobiography LWB Black are 18 way adjustable power seats, leather surfaced tables, leather upholstery, 10.2 inch infotainment screen, chillers and power sun blinds etc. Diesel edition of the new SUV comes powered with a 4.4 litre SDV8 engine that is capable of generating around 339 PS power at the peak along with 740 Nm of torque. Petrol variant of the model comes fitted with a 5.5 litre V8 engine that churns out around 550 PS power at the peak along with 680 Nm of torque. Range Rover Autobiography LWB Black petrol trim is available for sale in India at a starting price of Rs. 3.83 crores only whereas the diesel trim of the SUV is priced Rs. 3.75 crores. This entry was posted in Autos, News on May 2, 2015 by UdutaHK.